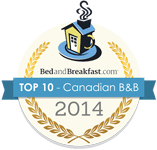 Our Kelowna bed and breakfast offers guests complete comfort to ensure your stay in the Okanagan Valley is both pleasurable and memorable. Relax in newly renovated rooms with either king or queen beds, ensuite bathrooms, and views of the city lights. Enjoy fresh coffee and tea outside in the garden. All our Okanagan B & B accommodations are decorated with fine furnishings, quality linens, new flat screen TVs, housecoats, fridges, complimentary beverages and thoughtful amenities for your convenience and comfort.